Let me remind you of a situation that happened in Jesus' life. He took a whip and entered the great temple of Jerusalem. "A whip in the hand of Jesus....? 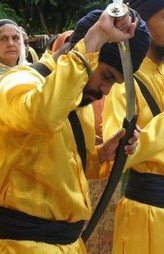 "This is what Guru Gobind Singh Ji means by "When all else has failed,it is just to take to the sword. "Yes, Jesus can handle the whip, no problem;the whip cannot overpower him.He remains alert, his consciousness is such. The great temple of Jerusalem had become a place for robbers.There were money changers inside the temple and they were exploiting the whole country.Jesus alone entered the temple and upturned their boards-the boards of the money changers-threw the money around and created such a turmoil that the money changersescaped outside the temple.They were many and Jesus was alone.He was in such fury, such rage! Now, this has been a problem for the Christians;how to explain it?- Because their whole effort is to prove that Jesus is a dove, a symbol of peace.How can he take a whip in his hands?How can he be so angry, so enraged that he upturned the boards of the money changers and made them scram for their lives? And he must have been on fire, he was just by himself, yet he was unstoppable. Such was his shakthi, that the priests and money changers cried "The man has gone mad!" Christians avoid this story. There is no need to avoid it if you understand: Jesus is innocent. He is not angry or enraged, its just his love and compassion for upholding righteousness.The whip in his hand was a form of shakti, which was to uproot evil and tyranny. Today, we are experiencing the same problem in our community. Corrupt managements controlling gurudwaras, and hijacking funds for their own selfish needs.Lack of gurmat and parchaar in the gurudwaras.Any promising katha vachak giving out speeches which wake the guilt in us,is immediatley kicked out on fake allegations.Angs being skipped whilst the Akhand Paath reading is going on. Sometimes, youths in bana are questioned and chided for wearing their kirpans outside, or simply for dressing different.Just because it makes the majority guilty when they see a amritdhari khalsa in full saroop. They wanna bring him down and away from gurmat too. You know what else is happening.If Jesus could kick those corrupt money changers out all by himself, why cant we? Christians claim him to be the son of god, so are we. We are children of Akal Purakh.We are the youths of today, we are the children of siri guru gobind singh ji... we cannot tolerate this kind of beadbi going on in our father's house.Let us all unite under one banner, and have a common goal of bringing about changes to our gurudwara systems. Lets do it through legal means.We can do it. The future of Guru Nanak's sikhi lies in our hands now.